Good Tuesday Morning! Wishing you a day full of blessings! Today I am sharing a re-do project! I have been working on this Hall Bath for months! It started with needing a new sink/vanity and flooring, when we could not find the sink/vanity it turned into a re decorating project! I have decided on 2 floors, as soon as we find the sink/vanity I can decide on the floors! In the meantime, the bathroom was done in a deep orange color with browns. Loved the color (Pumpkin by Behr) it isn’t a very bright orange color. It was time for a change. 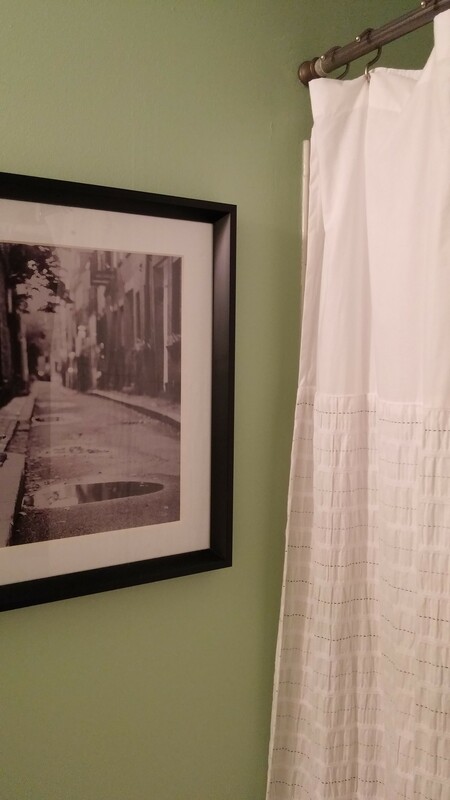 I found a black and white framed photograph, a bike on a side street and my inspiration for the room came together! I painted and distressed a mirror awhile back and really wanted to use that. This combined with the picture lead to me wanting a vintage feel in the room. 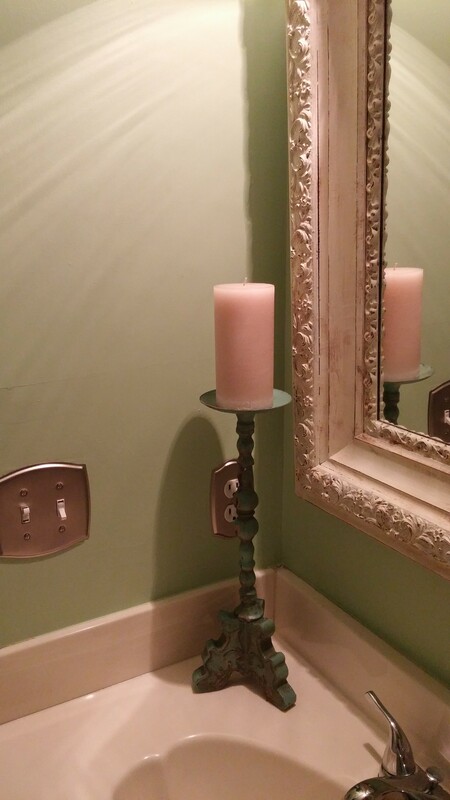 With the help of my dear friend and amazing decorator, Diane, I decided on a “vintage” green! I am partial to Sherwin Williams, love their paint AND their customer service! I choose the color Romaine! Yes of course a food name, LOL! Then the rest just fell into place. The lighting I found wasn’t vintage but had the “feel” of vintage same with the shower curtain. 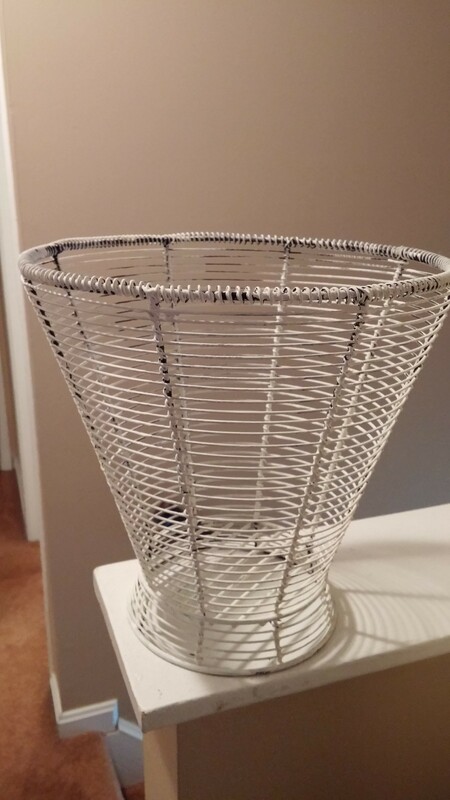 I could not find a vintage looking wastebasket so I created my own from a brown wire one I had! 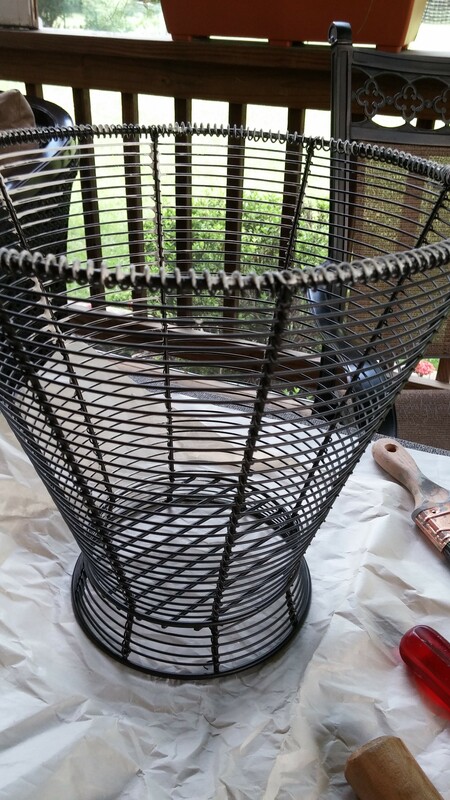 Re cycling decorative items with chalk paint is the way to go! 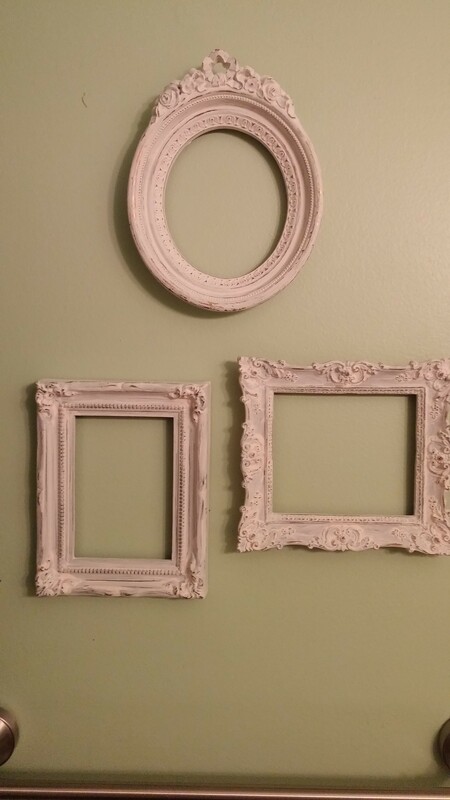 I found the sweet mini frames at the Flea Market, love the touch they add, am thinking of jazzing them up possibly with a word inside the frame, still thinking on that. Take a mini tour with my pictures below! I am still looking for the sink/vanity and truly hope to find one very soon. I’ve also been re painting some rooms in the color they are! It is always a good feeling to re freshen your house! ENJOY!